Unquestionably, we're highly competitive when it comes to supplying you with Xerox 6250DT toner cartridges. Each order placed for this Xerox Phaser 6250-DT toner is fully covered by our own low price guarantee so that the price you can see is the price you pay!We pride ourselves on supplying fine quality toner for the Xerox Phaser 6250-DT laser printer that have been thoroughly examined by specialists to enable efficient operation. And for extra reassurance, we offer a complete, rock solid money back guarantee on this Xerox Phaser 6250DT toner so you'll not ever be forced to settle for a poorly performing cartridge. Remember, we offer fast and free on Xerox Phaser 6250DT toner cartridges to save you time and money. Ordering your Xerox toner at Cartridge Save could not be simpler. Our friendly customer support staff are available to look after your order all the way. So place your order now and save. 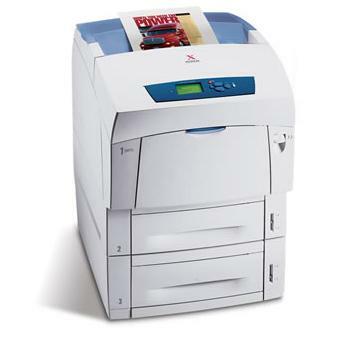 The Xerox Phaser 6250DT has high standard paper handling capacity and comes with built-in networking connectivity and a duplexer. This modern unit delivers great quality output, from coloured images to black and white text. It has a maximum resolution of 2400 x 2400 dpi and even offers photo mode. The Xerox Phaser 6250DT colour printer comes pre-installed with 512 MB RAM, and an optional 20 GB hard drive is available. The Xerox Phaser 6250DT colour laser printer comes with a 500-sheet standard tray, 500-sheet feeder, and a 100-sheet multi-purpose tray. Print speed is 26 ppm for both coloured and monochrome output. The Xerox Phaser 6250DT printer can handle 100,000 pages every month. This versatile and reliable model can likewise handle different types of media. Using the Xerox Phaser 6250DT laser printer is easy, from installation to operation. It has a duplexer for automatic double-sided printing and also has an Ethernet interface for convenient networking. The Xerox Phaser 6250DT delivers good quality output at a reasonable speed. Savings can be made by installing compatible Xerox Phaser 6250DT laser toners into the machine which act as a cheaper alternative to Xeroxs supplies. This printer would benefit from Wi-Fi connectivity. Even though its speed is reasonable at 26 ppm, there are other colour laser printers that can perform faster than the Xerox Phaser 6250DT. The Phaser 6250DT can also use another USB port for thumb drives to allow print-from functionality.